Psirri is a neighborhood that is difficult to describe. In most travel guides it is described as a great tourist attraction with excellent restaurants, vivid nightlife and chic stores. That is all true. Psirri is a very old neighborhood which has seen many transformations, and today it is still a great place to see traditional market district merchants before they are completely displaced by more modern and contemporary methods, or priced out of the neighborhood by the ever increasing rents of the chic boutiques and trendy cafes and clubs and loft conversions. 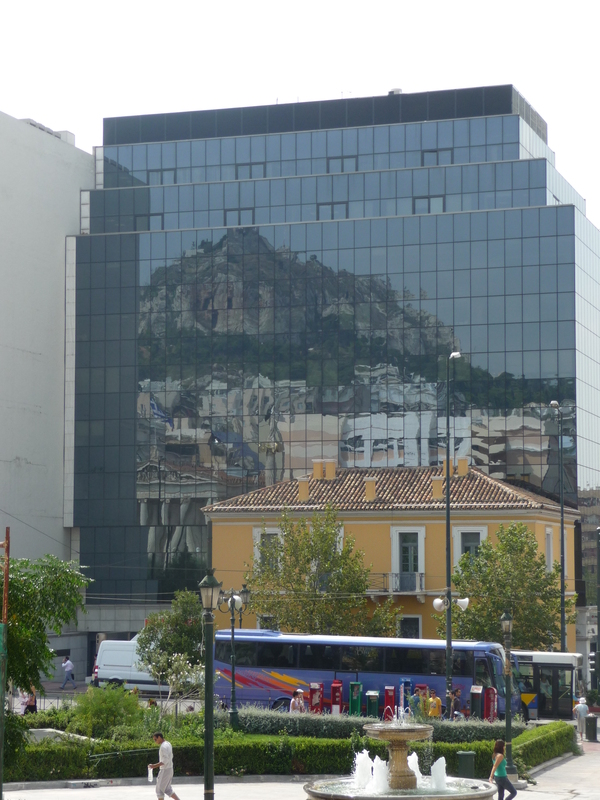 It is located right across from Monasteraki, bordered by Ermou and Athinas streets. It has been a warehouse district, an artisan haven, a place where you can find just about anything, from great leather pieces for professional leather craftsmen, metal smiths, to the manufacturer of belt buckles for the Greek military housed in an incredibly small shop in the basement of an old building. My father, visiting from Chicago, sent us on a quest for shoe insoles. 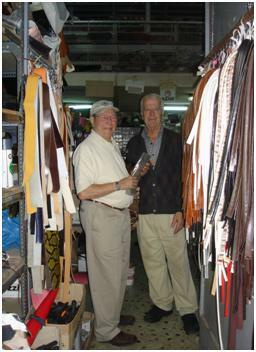 It was actually he would discovered this leather and schatzki emporium, where I am quite sure he spent hours amongst the stacks and piles and rows while my mother and her friends wandered in and out of the trendy clothing stores and chic boutiques that are slowly displacing the neighborhood’s original wholesalers and suppliers like Mr. Vagelis Karnasou. Afoi Karnasou is what the sign above the door says, but you don’t need to read the sign. 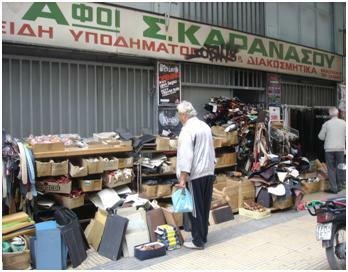 When you get to Miaouli street, (right off of Ermou if you are walking away from Athenas, towards Keramikos, at No. 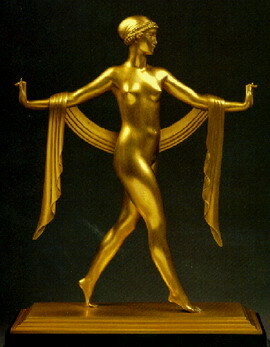 17, on the left side of the street). The dead giveaway are the piles of leather and leather items displayed on the sidewalk. Out front you may find Mr. Vagelis himself, who I don’t think speaks much English, but who has a great smile and a store full of treasures. Plastic buckles for fanny packs (rucksacks to our British friends), beads (at a fraction of the price the store across Ermou Street, in Monastiraki, sells them for, I even suspect that the Monastiraki store buys its beads from Mr. Vagelis), metal ornamental items (I got some great ornaments for my nieces who these days are into making their own clothes), leather soles for shoes, leather shoe insoles (yup, there’s my dad in his first ever Internet appearance, showing off his new leather insoles with Mr. Vagelis), leather belts… anything a shoemaker would need to run his business. He is primarily a wholesaler, but retail trade is welcomed. If nothing else it’s worth a visit just to look around at an image of yesteryear, of a shop that is being displaced by big impersonal companies and a neighborhood where the old shops are turned into fashionable restaurants and bars. Lost somewhere in the heart of Psirri, we came upon the smell of garlic – following our nose lead us to a site that none of us imagined finding in the center of Athens. 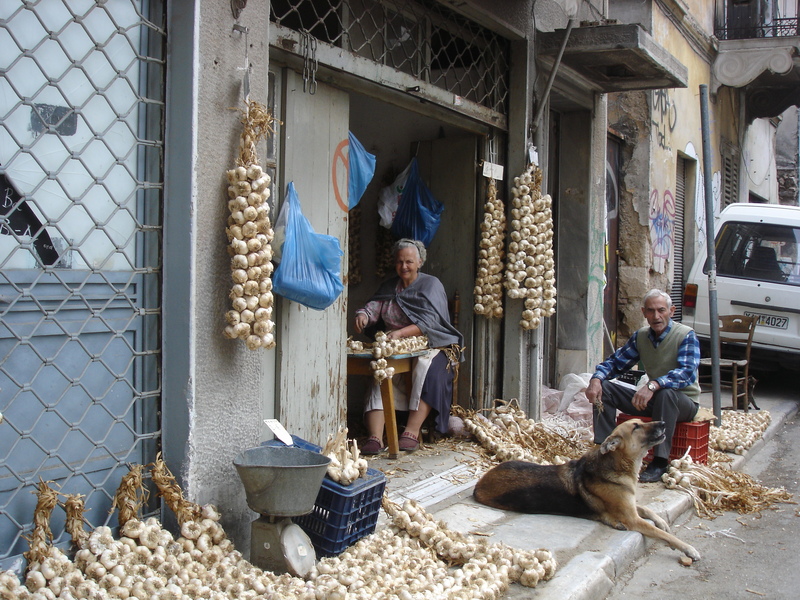 Kyrios Yorgos and Kyra Kyriaki (Mr. and Mrs. for our non Greek speaking friends) were sitting at their shop, which opened to the street, braiding garlic. In front of them, a big female German shepherd named Rega (smoked herring in Greek!) was enjoying the warm sun. The dog is pretty old and probably deaf, and will probably bark when you approach, but her barking seems like a call to come visit rather than a “go away” – in any event, it’s hardly threatening, and the sight and smell on your approach make it worth tolerating. 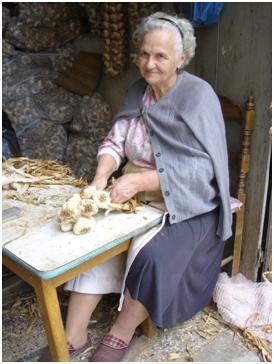 Kyra Kyriaki, was seated in front of a small table braiding garlic. Behind her sacks of garlic were neatly stacked, from floor to ceiling, filling every inch of the compact garage-like store front. With garlic filling the entire shop, Mr. Yorgos was seated outside, braiding garlic a few feet from where his dog sat, while a chocolate brown, calico cat prepared herself for a nap in the afternoon sun near the back of his chair. The sidewalk in front of the store was filled with neat rows of braided garlic. A few strands of garlic hung by the door with prices on them. I bought 3 heads of elephant garlic for 1€ and exchanged pleasantries with the couple. I don’t think that they were accustomed to people just stopping by. 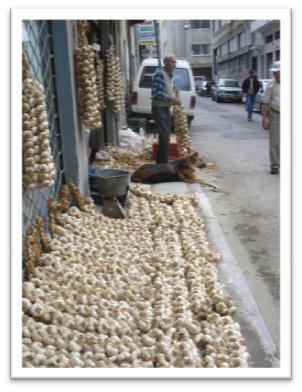 They are wholesalers, but as evident from the display in front of the store, they don’t mind if somebody stops by and buys some of their garlic. We all had smiles when we left the store… our mouths watering as we set off for home – anticipating the skordalia and bazaria (beet root salad with garlic sauce) and fresh tzatziki with garlic, cucumbers and yogurt we would make with our surprise Psirri find. PreviousIs that a Greek bagel?